Richard Vershaun Seymour (born October 6, 1979) is a former American football defensive lineman who played in the National Football League (NFL). He played college football for the University of Georgia, and was drafted by the New England Patriots sixth overall in the 2001 NFL Draft. Seymour has played in seven Pro Bowls, has been named to three All-Pro teams, and has been a member of three Super Bowl-winning Patriots teams. Some have considered Seymour to be the best defensive lineman in the NFL. He has also been described as the best #6 overall draft pick of all time. Seymour has gone to the Pro Bowl both as a 4-3 defensive tackle and as a 3-4 defensive end. He has also occasionally played fullback on short yardage and goal line situations. However, Seymour has not seen work as a fullback since suffering a knee injury on a one-yard Corey Dillon touchdown run against the San Diego Chargers in October 2005. At Lower Richland High School in Hopkins, South Carolina, Seymour won first team All-Region honors, won first team all-area honors, and as a senior, was voted the team's best defensive lineman, was a team captain, won an All-Area Player of the Week award, led his team to four All-Area Team of the Week honors, and finished the season with 8 sacks and 83 tackles. Seymour appeared in nine games during his 1997 freshman year at right defensive tackle and made two tackles and had a quarterback pressure. He also appeared in every game in 1998 as a sophomore and made 4 starts. He finished fourth on the team with 69 tackles (32 solos) and had 4 sacks and 14 quarterback pressures. Seymour's 2005 season began with the defensive end recording two sacks and averaging more than five tackles in the first four games before Seymour suffered a left knee injury playing fullback in a goal line situation against the San Diego Chargers in Week 4. He missed the next four games, returning on November 13. Seymour finished the season with four sacks and 46 tackles, and was named to his third-consecutive first-team All-Pro team as well as his fourth consecutive Pro Bowl, which he did not play in due to injury. The 2006 season became the third straight in which Seymour would have to endure an injury; a left elbow injury suffered in Week 7 lingered throughout the season and cost Seymour a start in Week 8, but Seymour still appeared in all 16 regular season games and the playoffs. Seymour was fined $7,500 by the NFL for stepping on Indianapolis Colts offensive lineman Tarik Glenn during a November 5, 2006 game. Seymour was reportedly angered that Glenn was diving for Seymour's knees. Regardless, Seymour professed his regret for the incident and stated he would apologize to Glenn at their next meeting. Seymour, who also had a groin injury and admitted he was not 100 percent, tallied four sacks, 40 tackles, and a blocked field goal on the season. He was named to the 2007 Pro Bowl, his fifth straight, and was a second-team All-Pro selection. However, he did not play in the Pro Bowl for the second straight season. The 2008 season proved to be a much healthier one for Seymour, who started the first 15 games, only to miss to the season finale against the Buffalo Bills with a back injury. Seymour tied his career high of eight sacks, recorded 52 tackles, and also led the team with 17 quarterback hits but for the second straight season was not named to the Pro Bowl or All-Pro teams but was as a key part of a defense that finished eighth in the NFL in allowing 19.3 points per game. The Boston Herald, Boston Globe, and National Football Post all claimed that on or before September 10, the Raiders sent Seymour a formal letter ordering him to report within five days or risk being placed on the reserve/left squad list, which would prevent him from playing for any team in 2009, and thus would prevent him from achieving free agency until he played out his contract in 2010. Moreover, the Herald reported that Seymour was in fact in possession of that letter. The next day, on September 11, he was placed on the team's exempt/left squad list. On November 2, Seymour was fined $15,750 for hitting Kansas City Chiefs quarterback Matt Cassel. On February 8, 2013, the Raiders voided the rest of Seymour's contract, effectively making him a free agent. The contract stipulated if Seymour did not meet a certain amount of allotted playing time the Raiders would have the option of voiding the final year of the deal. Due to an injury, he missed the final eight games of 2012 and was not able to meet the required amount of playing time. He was set to make $19.12 million in 2013 and will now count as $13.71 million of dead money for 2013. After he became a free agent, he drew interests and received offers from multiple teams but was mostly tied to the Atlanta Falcons. It was reported that if he was unable to get the contract he was seeking he was set to retire. ↑ Colston, Chris (2006-05-31). "If you have just one lineman, make it Seymour". USA Today. Retrieved 2009-05-18. ↑ Cole, Jason (2006-10-11). "Breakfast of champions". Yahoo! Sports. Retrieved 2009-05-18. ↑ Robinson, Charles (2007-04-23). "Best all-time first-round picks". Yahoo! Sports. Retrieved 2009-05-18. ↑ Robinson, Jon (2004-11-12). "Richard Seymour Interview". IGN. Retrieved 2009-05-18. 1 2 "Patriots will be without DE Seymour against Atlanta". ESPN.com. 2005-10-08. Retrieved 2009-05-19. ↑ "Patriots' Seymour cleared to play". SportsTicker. NBC Sports. 2005-02-02. Retrieved 2009-05-18. 1 2 Pasquarelli, Len (2006-04-13). "Seymour, Pats agree to long-term extension". ESPN.com. Retrieved 2009-05-18. ↑ Reiss, Mike (2006-01-27). "Seymour out too". Boston.com Reiss' Pieces. Retrieved 2008-06-16. ↑ Reiss, Mike (2006-10-23). "Seymour awaiting word on sore elbow". The Boston Globe. Retrieved 2009-05-18. ↑ Reiss, Mike (2006-11-20). "Misstep is costly for Seymour". The Boston Globe. Retrieved 2009-05-18. ↑ Reiss, Mike (2006-11-13). "Seymour is moved to comment". The Boston Globe. Retrieved 2009-05-18. ↑ MacMullan, Jackie (2008-01-11). "The imperfect season of Richard Seymour". The Boston Globe. Retrieved 2009-05-18. ↑ Clayton, John (2007-09-03). "Surprisingly, Pats' Seymour to miss first six weeks". ESPN.com. Retrieved 2009-05-18. ↑ Gasper, Christopher L. & Reiss, Mike (2007-10-29). "Seymour proves to be a bit rusty in return". The Boston Globe. Retrieved 2009-05-18. ↑ Reiss, Mike (2008-12-27). "No Seymour for Patriots". Boston.com Reiss' Pieces. Retrieved 2009-05-18. ↑ "Seymour dealt to Raiders". ESPN.com. 2009-09-06. Retrieved 2009-09-06. ↑ Finn, Chad (2009-09-10). "What they're saying about Seymour". Boston.com Reiss' Pieces. Retrieved 2009-09-11. ↑ Gasper, Christopher L. (2009-09-10). "Reports:Five-day letter sent to Seymour". Boston.com Reiss' Pieces. Retrieved 2009-09-11. ↑ Rapoport, Ian (2009-09-11). "Defensive end Richard Seymour has received the letter from the Raiders". Boston Herald. Retrieved 2009-09-12. ↑ Biggs, Brad (2009-09-12). "Raiders place Seymour on left squad list". National Football Post.com. Archived from the original on September 14, 2009. Retrieved 2009-09-12. 1 2 3 Gasper, Christopher (2009-09-12). "Reports: Seymour reporting to Raiders". Boston.com. Retrieved 2009-09-12. ↑ Cole, Jason (2009-09-12). "NFLPA no longer pursuing grievance". Yahoo! Sports. Retrieved 2009-09-12. ↑ Kukura, Joe (2010-05-04). "Raiders, Seymour talking long-term deal". NBC Bay Area. Retrieved 2010-05-04. ↑ "Raiders' Seymour signs franchise tag". ESPN.com. Associated Press. 2010-06-19. Retrieved 2010-06-19. ↑ Adam Gretz %BloggerTitle% (2010-11-21). "Richard Seymour Ejected for Punching Ben Roethlisberger: Video". Aolnews.com. Retrieved 2012-09-16. ↑ "Raiders DL Richard Seymour fined $25,000". USA Today. 2010-11-22. ↑ "Source: Richard Seymour, Oakland agree to extension". ESPN.com. ↑ Levi Damien. "Report: Oakland Raiders Void Richard Seymour contract, but pay heavy price". Retrieved October 31, 2016. ↑ Gregg Rosenthal. 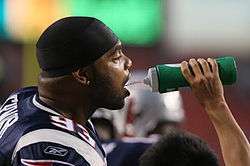 "Richard Seymour ready to Retire without right deal". Retrieved October 31, 2016. ↑ "Richard Seymour Stats". ESPN Internet Ventures. Retrieved 10 January 2014.